VANCOUVER, BC--(Marketwired - February 04, 2015) - BriaCell Therapeutics Corp (TSX VENTURE: BCT), an immuno-oncology focused biotechnology company with a proprietary vaccine technology (BriaVax™), today announced that the Company will present at the 2015 BIO CEO & Investor Conference on Tuesday, February 10, 2015 at the Waldorf Astoria Hotel in New York City. The Company will provide a corporate overview and will present BriaCell's technology and clinical data and near-term plans. Investors or potential partners attending the conference who wish to meet with Company's representative should contact the BIO Partnering Team at biopartnering@bio.org. BriaCell listed onto the TSXV and closed its concurrent financing in December 2014, and has since been working diligently on its core operations in order to move towards its upcoming clinical trial. This upcoming presentation will be BriaCell's second conference in its recently launched broader investor relations campaign. BriaCell's CMO Dr. Charles Wiseman commented, "Although BriaCell is grateful to have a strong core group of supportive shareholders, we have only recently begun a campaign to raise awareness in the broader investment community. We believe that BriaCell has a unique and exciting technology and we are pleased to be meeting with new investors. This campaign began when we recently attended the AlphaNorth Capital Conference, our first investor conference since listing, and we were very pleased with the level of interest from investors who had not yet heard our story." 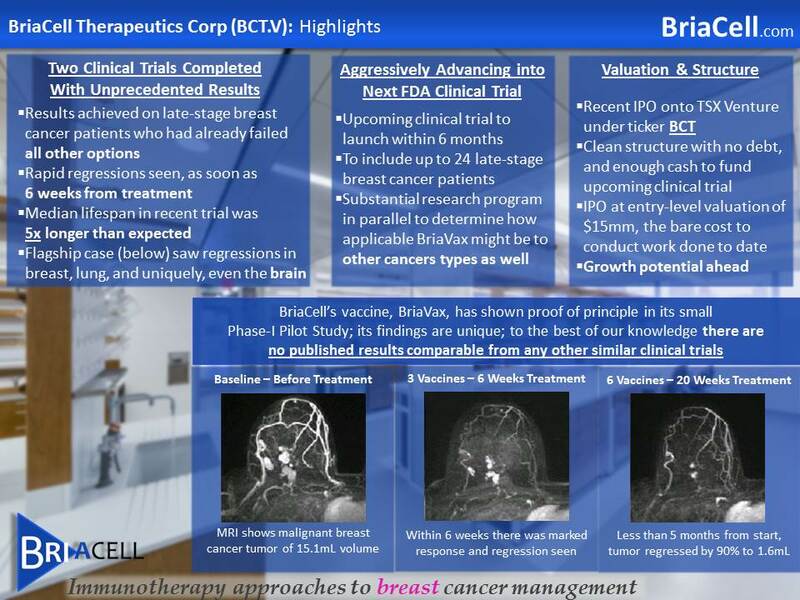 BriaCell is an immuno-oncology focused biotechnology company that has demonstrated unique and unprecedented clinical results, and is intent on building upon these results to further advance BriaVax™ through the FDA clinical trials in order to help cancer patients with no other options. The results of two FDA Phase I clinical trials have been encouraging in terms of both safety and efficacy in patients with advanced, stage-IV breast cancer. Most uniquely, BriaCell has achieved these results in patients who had prior failed all other available therapies including various kinds of chemotherapy. In some cases, the lifespan was five times longer expected. The results were targeted, with little to no side effects, and were achieved rapidly, with regression occurring within 6 weeks. The Company is planning to advance its cancer immunotherapy technology in an approved FDA Phase I/II clinical trial with up to 24 breast cancer patients with advanced stages of solid tumors. The FDA-approved protocol has provision to allow testing the vaccine in selected patients with other cancers as well, including prostate, ovarian, pancreas, lung and bladder cancers among others. Although the focus of the Company is currently breast cancer, it recognizes that upon further proof of concept, its technology may be applicable to such other cancers as well. For further information, please refer to Company's website at www.briacell.com or its YouTube channel www.youtube.com/watch?v=el-yFF1uHoQ. The TSX Venture Exchange Inc. has in no way passed upon the merits of the Company has neither approved nor disapproved the contents of this press release. Neither TSX Venture Exchange nor its Regulation Services Provider (as that term is defined in the policies of the TSX Venture Exchange) accepts responsibility for the adequacy or accuracy of this release. This news release contains forward-looking information, which involves known and unknown risks, uncertainties and other factors that may cause actual events to differ materially from current expectation. Important factors -- including the availability of funds, the results of financing efforts, the results of exploration activities -- that could cause actual results to differ materially from the Company's expectations are disclosed in the Company's documents filed from time to time on SEDAR (see www.sedar.com). Readers are cautioned not to place undue reliance on these forward-looking statements, which speak only as of the date of this press release. The company disclaims any intention or obligation, except to the extent required by law, to update or revise any forward-looking statements, whether as a result of new information, future events or otherwise. This press release does not constitute an offer to sell or a solicitation of an offer to sell any of the securities described herein in the United States or elsewhere. These securities have not been, and will not be, registered in the United States Securities Act of 1933, as amended, or any state securities laws, and may not be offered or sold in the United States or to U.S. persons unless registered or exempt therefrom. 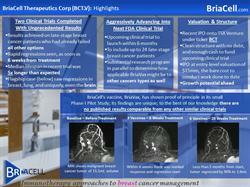 About this company BriaCell Therapeutics Corp.